I loved painting this bird. I decided to paint it in oils. These robins can be found in the coolest parts of south-eastern Australia as well as in Tasmania. They are about 12 - 14 cm long. I have a few other Australian birds lined up to paint in the larger format as opposed to the aceo's - I will paint some in oils and others in acrylics on paper. Flame Robin measures 6 x 6 inches and is painted on Ampersand Gessobord panel. I really enjoyed painting this one. I changed the trees to that of the autumn colours. I think it works rather well. It was fun painting the waterfall so I will have to look for some more waterfall reference photos that I can use. 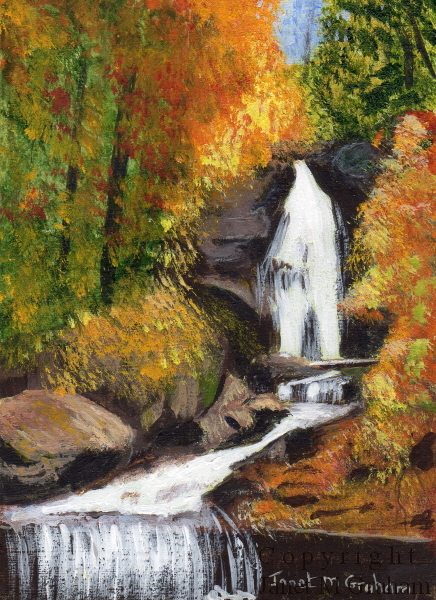 Autumn Waterfall measures 2.5 x 3.5 inches and is painted on 300gsm smooth Arches watercolour paper. I had to paint this one twice - seems to be one of those weeks. First time round, I just was not happy with the blue feathers - I used ultramarine blue and a bit of prussian blue which just didn't look right. So the second time round, I used my phthalo blue watercolour paint for the feathers and I am much happier with the result. Superb Fairy Wren measures 2.5 x 3.5 inches and is painted on 300gsm smooth Archers watercolour paper. I had do the background twice for this one. First time round I just wasn't happy with it and ended up throwing it away and starting again on new card/paper. Much happier how it turned out the second time. Rather pleased how the bird turned out as well. Townsend's Warbler is a small songbird and is about 12 cm long. 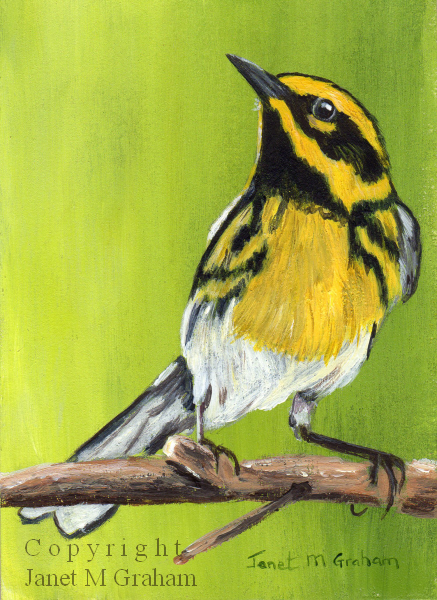 Townsend's Warbler measures 2.5 x 3.5 inches and is painting on 300gsm smooth Archers watercolour paper. I really enjoyed painting this one. It is the smallest honeyeater in Australia with the male being only 10 - 11 cm long. It can be found on the east coast of Australia, Indonesia and New Caledonia. 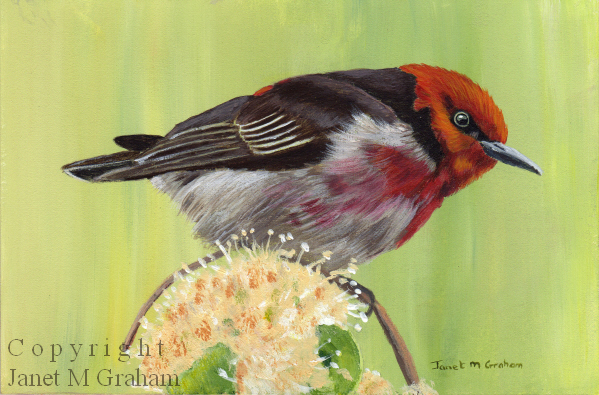 Scarlet Honeyeater measures 6 x 4 inches and is painted on 300gsm smooth Arches watercolour paper. This is the second watercolour landscape that I did. The pathway was a bit tricky but I eventually got there. I actually think the two watercolour landscapes compliment each other rather well. 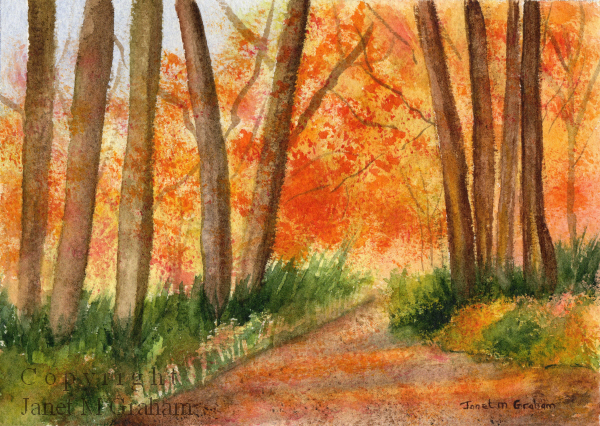 Autumn Walk measures 7 x 5 inches and is painting on 300gsm rough Arches watercolour paper. I painted two watercolour landscapes yesterday. This is the first one - Bluebell Woodlands. I added the puddle of water to make it a bit more interesting. Rather pleased how it turned out. 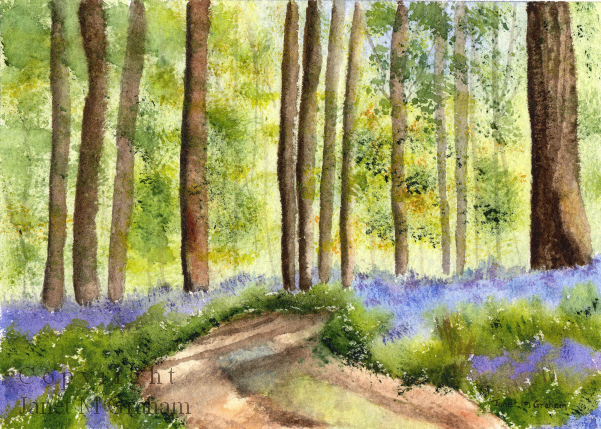 Bluebell Woodlands measures 7 x 5 inches and is painted on 300gsm rough Arches watercolour paper. This one was fun to paint. I changed it a bit from the reference photo and rather pleased how it turned out. We were rather cold start to the day today. Was only around 7 degrees this morning. Must be the last cold snap before spring. 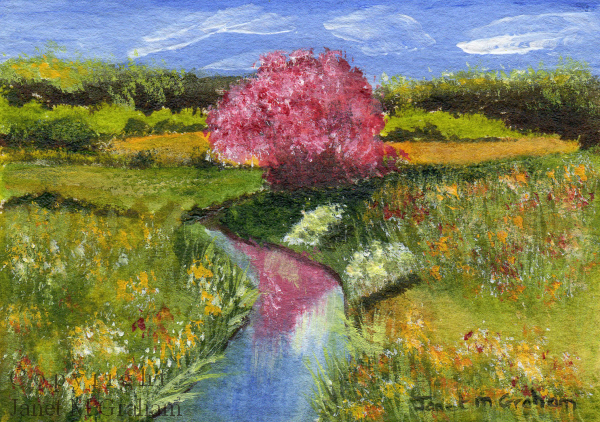 Summer River measures 3.5 x 2.5 inches and is painted on 300gsm smooth Arches watercolour paper. 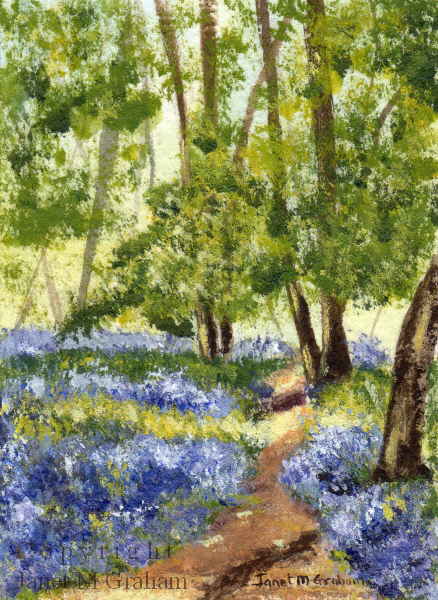 I love painting bluebell woods. This one was fun to paint. I am actually thinking of painting a larger 5 x 7 inches bluebell scene but in watercolours so will see how I go tomorrow. 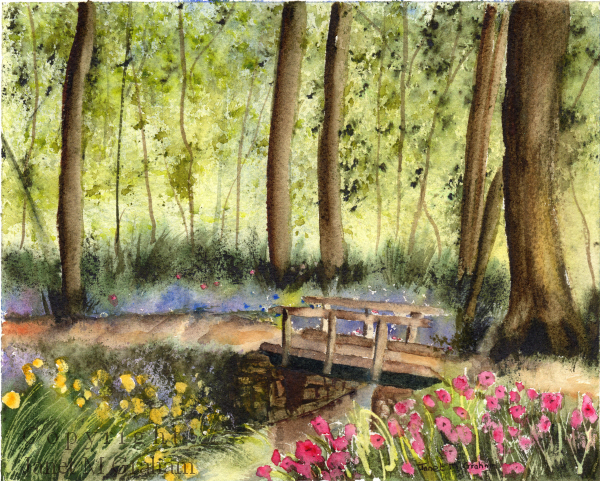 Bluebell Walk measures 2.5 x 3.5 inches and is painted on 300gsm rough Arches watercolour paper. I couldn't resist painting this cute bird. I love its blue eyes. I used a few of my watercolour green paints for the feathers. These birds are found Dominican Republic and Haiti. 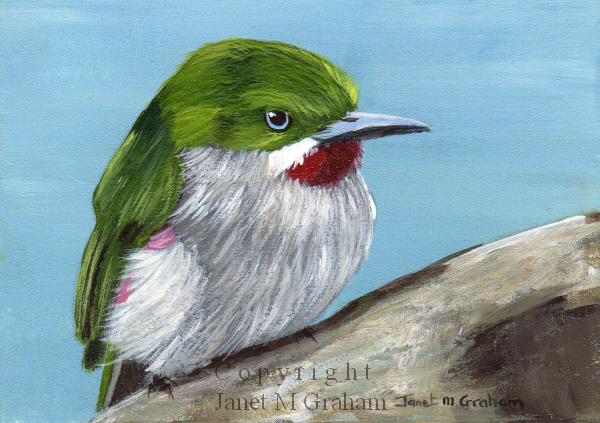 Narrow Billed Tody measures 3.5 x 2.5 inches and is painted on 300gsm smooth watercolour paper. 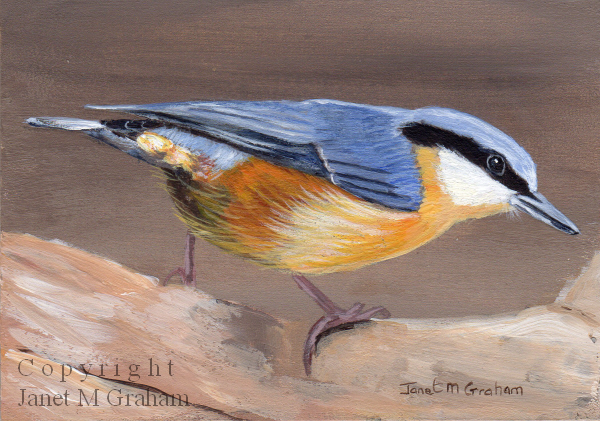 Wood Nuthatch measures 3.5 x 2.5 inches and is painted on 300gsm smooth Arches Watercolour paper. 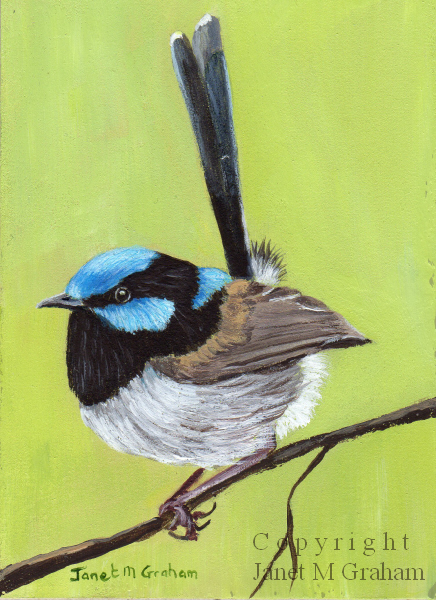 I love painting the little fairy wren birds. These wrens can be found across most of Australia. They are just not found in Tasmania. I started out painting this one just in acrylics but felt that the feathers needed the addition of some other blues (Cobalt and Phthalo blue) so I ended up also using my watercolour paints. 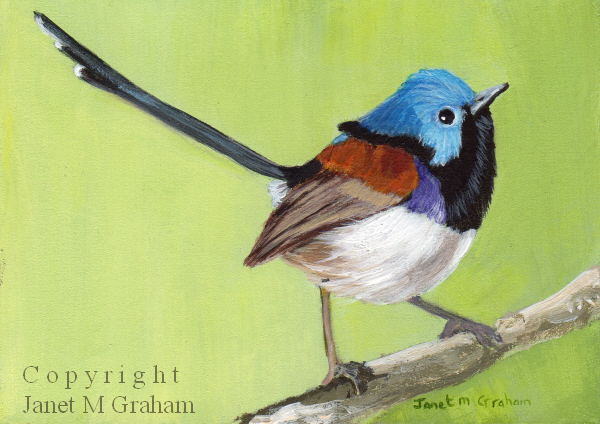 Variegated Fairy Wren measures 3.5 x 2.5 inches and is painted on 300gsm smooth Arches watercolour paper. Many thanks James Niland for the reference photo. 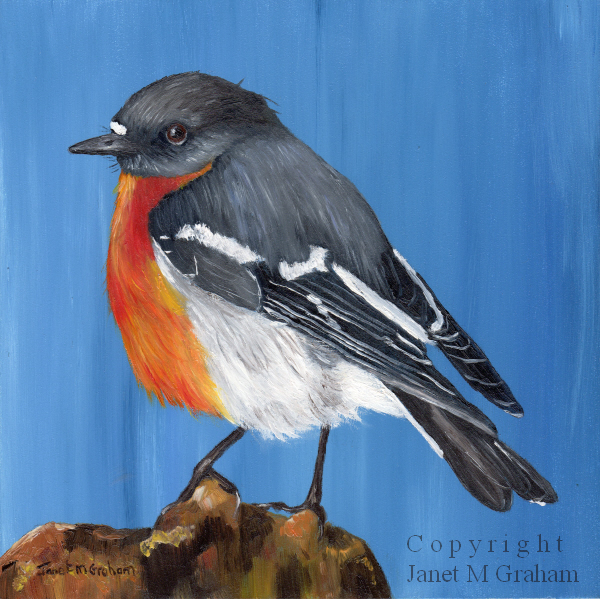 I had paint left over from painting the Scarlet robin, so I decided to paint this one as it used the same colours. An interesting fact about this bird is that they normally just eat insects but they do have a brush tipped tongue and have been seen taking nectar from flowers / trees. 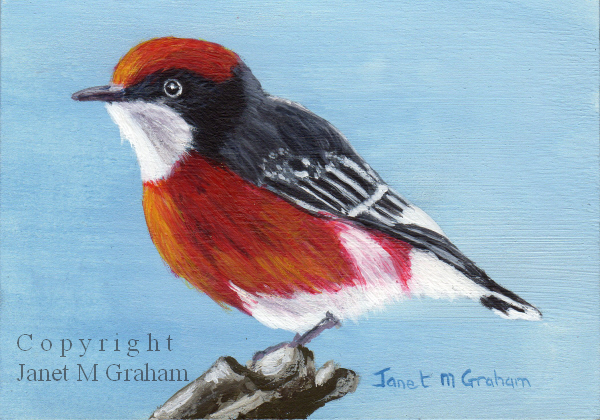 Crimson Chat measures 3.5 x 2.5 inches and is painted on 300gsm smooth Arches watercolour paper. I usually use French Ultramarine blue for the background blue colour but this time around I used Prussian blue as I wanted a cooler blue. I am really pleased with this one. Some interesting information about Scarlet robins is that they range in length from 12 to 13.5 cm and weigh between 12 to 14 grams. 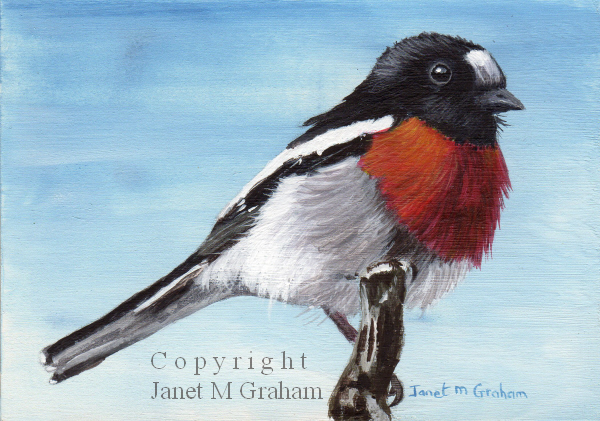 Scarlet Robin 2 measures 3.5 x 2.5 inches and is painted on 300gms smooth Arches watercolour paper. I love the colours of autumn. This one was fun to paint. I used the rough watercolour paper as I wanted to create a bit of texture for the trees. We have been having our normal winter weather for the last couple of weeks which has been lovely. Went down to Redcliffe the other day (about a 15 minute drive away ) and had fish and chips on the beach - the water was crystal clear - I haven't seen the water that clear for a while. I will have to take advantage of the weather as I think we are going to be in for a very hot summer. 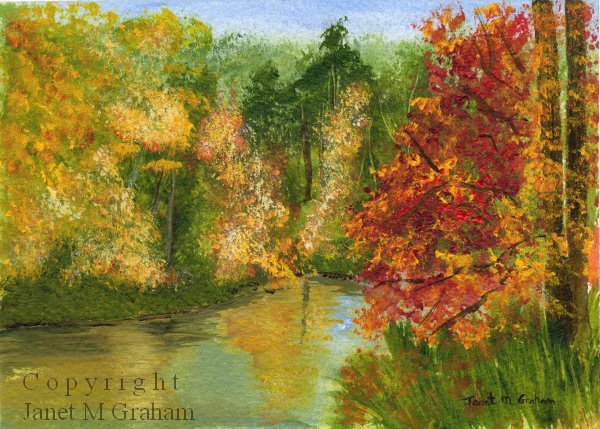 Fall measures 7 x 5 inches and is painted on 300gsm rough Arches watercolour paper. Many thanks to Ann Campbell for the reference photo. I enjoyed painting this little song bird. An interesting fact about this bird is that it as an unique tongue that is curled and semi tubular which allows it to collect nectar during winter. 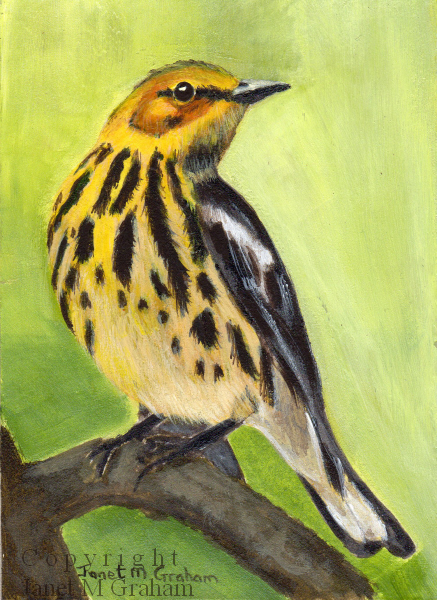 Cape May Warbler measures 2.5 x 3.5 inches and is painted on 300gsm smooth Arches watercolour paper. I decided to paint this lovely bird in a larger format. I just love its colouring. Some interesting facts about the Eastern Bluebird is that it can live for 6 - 10 years and the longest recorded livespan of a bluebird was 10 years and 5 months. 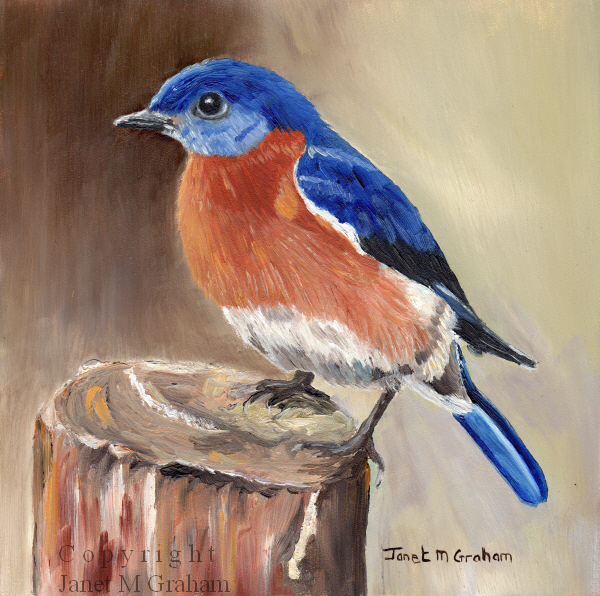 Eastern Bluebird measures 6 x 6 inches and is painted on Ampersand Gessobord. This one was fun to paint. I am thinking about painting a larger version in watercolours as I can then add a few other element into the scene. 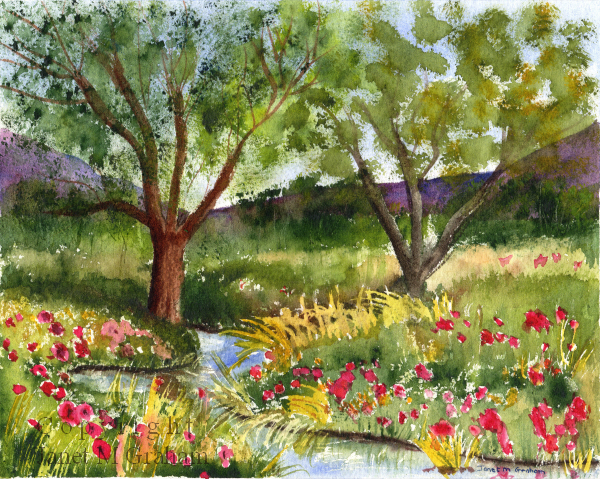 Flowers in the meadow measures 3.5 x 2.5 inches and is painting on 300gsm rough watercolour paper. This is one of the smallest birds in Australia being only 8 to 10 cm in length and can be found in most parts of Australia. They build nests at the end of narrow tunnels. I am really pleased how this one turned out - it all just seemed to come together. I had planned to paint some aceo's today but I had been thinking about how I would paint this scene in watercolours all weekend so decided to paint it instead and then give my full attention to the aceo's paintings tomorrow. 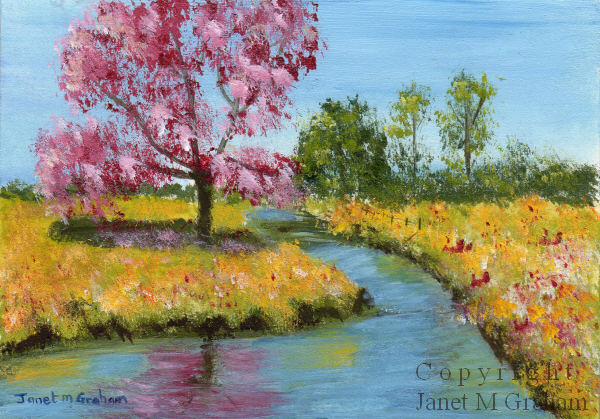 I had fun painting this one - I used quite a bit of artistic license when it came to painting the flowers and stream. I am rather pleased how it turned out. Woodland Bridge measures 10 x 8 inches and is painted on 300gsm Rough Arches watercolour paper. Many thanks to Max Hemingway for the reference photo. I was just going to paint this one in acrylics but I had some watercolour paint left over from my earlier watercolour painting and realised that the sunlight green watercolour paint was a perfect match for the hummingbirds feathers so I ended up using both acrylics and watercolours to paint this lovely little bird. 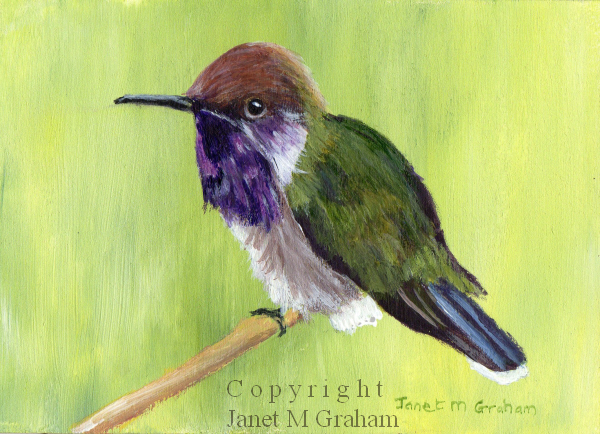 Bumblebee Hummingbird measures 3.5 x 2.5 inches and is painted on 300gsm Arches smooth watercolour paper. I felt like a change in medium so pulled out my watercolours. I had fun painting this one. What I do like about watercolours is that you can't really fiddle with the painting and I am able to paint in a more looser style which is a nice change from the more detailed paintings I do. Countryside measures 10 x 8 inches and is painted on 300gsm rough Arches watercolour paper. 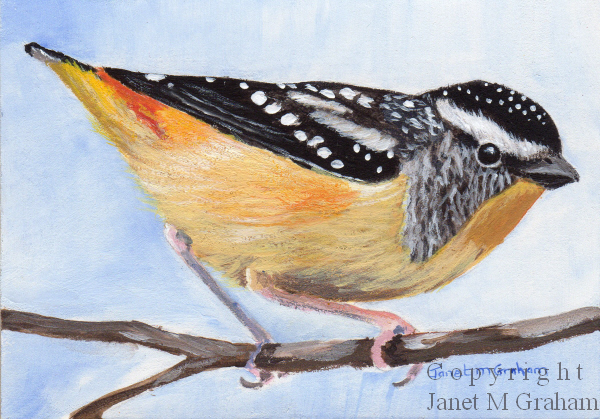 This is my larger version of the aceo painting that I did last week. It was interesting painting it in the larger format. It was fun painting the flowers. 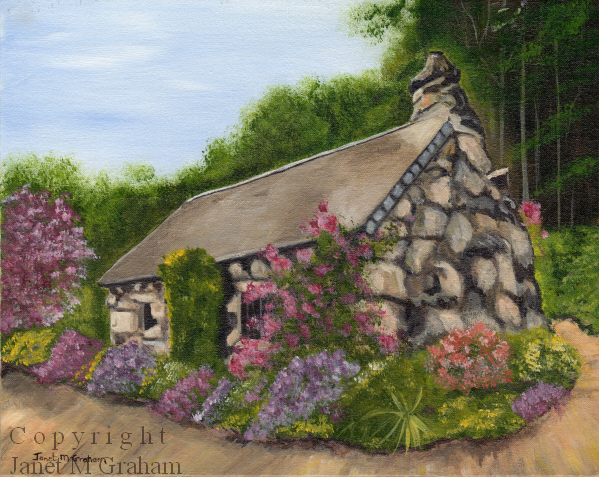 I am really pleased with this painting - I can just imagine myself living there. Country Home measures 10 x 8 inches and is painted on Fredrix Archival Watercolour Canvas Board.